This one is for the sorting of Pages in the BlogEngine 2.8 Page-List widget. By default, the sorting of the pages in the list was in the alphabetic order. However, I wanted to sort the page list in custom way. Unfortunately, there is no control/option for sorting the page-list widget. To sort the page list in custom order you’ll have to write a bit of code. Look for the BindPages() method in it. Now the Page inside that widget will be listed according to their created date field. We can easily modify this field to put a page at the top or at the bottom of the list. To do that, you have to open App_Data/pages xml-files . These xml files are the description of your pages in the blog. 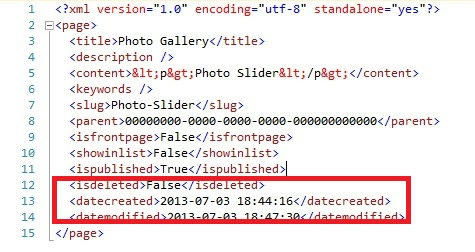 If you open it you will get the created date property there which you can easily modify. A snapshot of one of my page is give below for better understanding.